Ahenny - the way people stand when examing other people's bookshelves. Ainderby Quernhow - one who continually bemoans the "loss" of the word "gay" to the English language, even though they had never used the word in any context at all until they started complaining they couldn't use it any more. Bathel - to pretend to have read the book under discussion when in fact you've only seen the TV series. Beppy - the triumphal slamming shut of a book after reading the final page. Dalmilling - continually making small talk to someone who is trying to read a book. Fritham - a paragraph that gets you stuck in the book. The more you read it, the less it means to you. Great Wakering - the panic which sets in when you badly need to go to the lavatory and cannot make up your mind about what book or magazine to take with you. Liff - a book, the contents of which are totally belied by its cover. 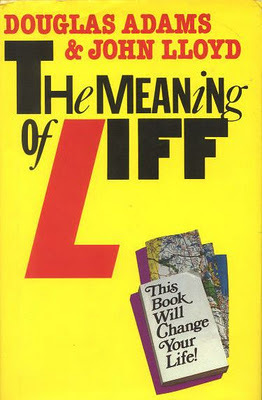 For instance, any book the dust jacket of which ears the words, "This book will change your life". Pulverbatch - the first paragraph on the blurb of a dust jacket in which famous authors claim to have had a series of menial jobs in their youth.